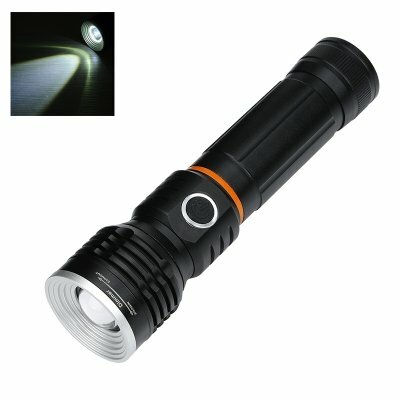 Successfully Added 320 Lumen COB LED Flashlight - Adjustable Focus, Floodlight, Magnetic Base, Aluminum Alloy to your Shopping Cart. This powerful 320 lumen COB LED flashlight offer much more than meets the eye. with 4 lighting modes (High, low, strobe, COB) you can illuminate the darkest places and light up your workspace. Using the high powered beam you can focus light on a particular area while the low powered beam is a great way to save charge when you don't need to see all the details but need a long usage time. With the strobe lighting mode you can easily attract attention or scare of assailants and with the COB Strip bar LED active you can stand the torch on its head, slide up the handle and floodlight a large area. A strong magnetic base lets you lock the touch in place to a metallic surface, great when working under on the car or for use in workshops as you can illuminate the area you need while keeping your hands free. Illuminate even the darkest places wherever you at home, outdoors, by the roadside or camping, with its tough aluminum alloy construction and good battery life this COB LED flashligh has a 100,000 hour lifespan and will light your way for years to come. This COB LED Flashlight comes with a 12 months warranty, brought to you by the leader in electronic devices as well as wholesale LED Lights.